WHAT: The 26th annual Whitworth Writing Rally is a family literacy initiative for students in pre-school through 6th grade. 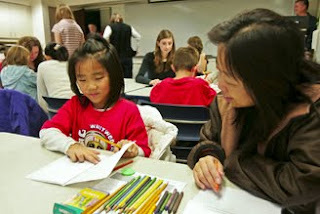 The event features presentations by a well-known children's author followed by opportunities for participants to work with area teachers or Whitworth education students to create their own original illustrated book. WHO: The 2009 rally will feature Candace Fleming, author of critically-acclaimed, bestselling books for children, including the picture books Muncha! Muncha! Muncha! and Boxes for Katje. She also has written nonfiction books for young adults, including The Lincolns, Our Eleanor, and Ben Franklin's Almanac. Two new books, Imogene's Last Stand, and The Great and Only Barnum: the Tremendous, Stupendous Life of Showman P.T. Barnum, are due out later this month. WHERE: Cowles Memorial Auditorium at Whitworth University, 300 W. Hawthorne Road. HOW TO REGISTER: Details are available by calling the Whitworth School of Education at (509) 777-3263; leave your name, phone number, and mailing address. A registration packet will be mailed to you. The Whitworth Writing Rally is an opportunity for children to develop their reading and writing skills with assistance from a professional author and trained educators. As many as 600 students from the Inland Northwest are expected to participate in the 2009 rally. Fleming will talk about where she gets her ideas and will show examples from her many books. A Whitworth improvisational theatre troupe also will perform. After each session, children are invited to attend a punch-and-cookies reception in the Multipurpose Room of the Hixson Union Building, where they will have the opportunity to share the books they have created. They can also meet Fleming during the reception and get her autograph. Lisa Laurier, Whitworth Writing Rally director and associate professor of education, Whitworth University, (509) 777-3263 or llaurier@whitworth.edu.